Folk Set In Sandstone opens on April 30th with a ceilidh with RIC SANDERS GROUP with support from acoustic songwriter Zinney. It's the unnofficial unnapproved royal wedding folk weekend ! 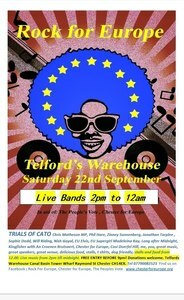 Both events will be preceded by informal music sessions from 1pm. I have to be there at 1 pm to stock up the bar so thought we may as well have a session too ! Refreshments and food will be ready some time after 1pm . Ric Sanders has been the violinist with Fairport Convention since 1985, touring the world with them and contributing many instrumentals and arrangements which have become fixtures in their repertoire. Prior to Fairport he played with The Albion Band (recording the classic album "Rise Up Like The Sun") and also Soft Machine. Over the years he has worked with a multitude of artists from the worlds of jazz, folk and rock including Martin Simpson, Andrew Cronshaw, June Tabor, Jethro Tull, John Etheridge, Gordon Giltrap, Roy Harper, Stomu Yamash'ta, Fred T. Baker, Didier Lockwood, All About Eve, Michael Garrick, Johnny Patrick, The Strawbs, Jerry Donahue, etc. Vo Fletcher's association with Ric Sanders goes back many years, and together they have played in many different musical settings. Vo now writes extensively for television and has been much involved in educational music. He has worked both in the studio and live with artists as diverse as (Nigel) Kennedy, John Etheridge, Andrew Cronshaw, Rik Mayall, Fred T. Baker, and David Lowe. He brings an enormous wealth of musical styles and improvisational skills to the group.